The Dino robot is designed to make vegetable weeding on large-scale vegetable farms easier. Its main asset is that it works autonomously, so you have more time for tasks with higher added value. 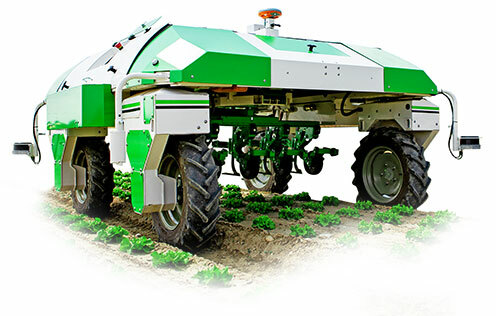 Dino is the first entirely autonomous electric robot to mechanically weed vegetable crops. The robot is designed by Naïo Technologies and has been on the market since early 2017. Today, more than 20 robots now weed our customers’ and partners’ vegetable fields in France and in Europe. The Naïo Technologies team is convinced that agricultural robots are THE solution to improved working conditions and profitability for farmers. To help farmers tackle the increasing regulations on phytosanitary products, the growing concerns with pesticides, and the lack of workers in the agricultural sector, Dino provides a new and effective solution. The Dino weeding robot allows vegetable farmers to manage crop weeding with a high level of precision, while helping them save time all through the season. Dino autonomously takes care of weeding your vegetable crops. The robot reduces workload and drudgery to create better working conditions. Dino helps you reduce both labor and variable costs. The robot is totally electric and considerably reduces energy and maintenance costs. It weeds mechanically, which also allows you to cut down on pesticides and plastic crop covers. The Dino robot mechanically weeds your vegetable crops all by itself. It frees up your hands and those of your team and leaves you more mindspace to help you concentrate on higher value-add tasks for your farm. Dino is an eco-friendly robot that weeds your crops mechanically with a range of specific tools. The robot is 100% electric and helps you reduce the use of weedkillers while simultaneously lowering your carbon footprint. Dino allows you to schedule weeding chores at the times that suit you best. As it works by itself, you’re now free to accomplish other tasks elsewhere while the robot weeds a given vegetable plot. The robot is entirely electric, so you no longer need to spend time on the maintenance of your farming tools. Dino is an entirely autonomous weeding robot. It works all by itself, without the need for supervision, at a 2 cm precision range, thanks to its GPS RTK guidance system. The robot’s weeding tools are also camera-guided. The vision system detects crop rows and adjusts the weeding tools’ position to allow for high-precision hoeing and weeding. Registration of the plot map. To work autonomously in all vegetable rows. Thanks to its vision system, the robots detects the crops and places the tools as closely as possible to the vegetable plants. Size: Length 250 cm / 98,4 inches – Height 130 cm / 51.2 inches- Adjustable distance between wheel axis from 140 to 180 cm (55.1 to 70.9 inches), i.e. a maximum length of 250 cm / 98.4 inches. Origin: designed and manufactured in France. * Under ideal conditions, these values may vary according to actual conditions of use. NOT THE ROBOT YOU'RE LOOKING FOR ?